A patio provides an ideal way of enjoying the outdoors. It can offer an extension of your home, as it expands the seating and entertaining areas available. You could also have a patio at your business, for employees and customers to enjoy. Outdoor lighting can make your patio more beautiful as the sun goes down and help you continue to use it for extended hours. At Enhanced Outdoor Lighting & Design, we provide expert patio lighting solutions for San Antonio and Austin area homes and businesses. We can turn your patio area or deck space into a sparkling nighttime wonderland. With professional patio lighting, you can avoid the temporary or less visually appealing outdoor lighting options that are often used in this type of outdoor space. Instead of Tiki torches, string lights with unsightly cords, candles, and lanterns, your outdoor space can have patches of light that seamlessly brighten up the space without detracting from the patio’s design and decor. You’ll gain a more professional or high-level lighting look that fits with the rest of your well-planned design scheme. A patio can use similar forms of professional lighting as other outdoor spaces. Our goal is to enhance specific parts of this area within a well thought-out design. We would customize the plan to fit the specifics of your patio area and to match your preferences. 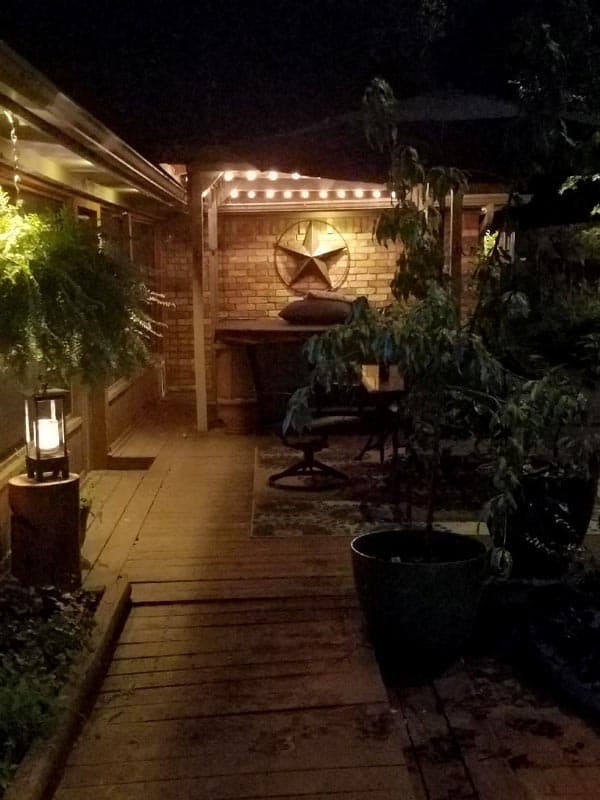 With patio lighting, we can enhance the architectural quality and aesthetic design of your patio space while also making the space more functional at night. With permanent lighting solutions, you can easily have a family dinner outside in the evening or extend a nighttime gathering into your outdoor space with no need to lug candles or lanterns outside. You’ll be able to sit on your patio furniture any time of evening or night to admire the peacefulness of these times of day and to enjoy the evening breezes or the nighttime stars. Our lighting professionals can highlight certain aspects of your patio, such as decorative features, plants, or borders. We can create lighting designs that illuminate the flooring of the space, that spotlight a feature, or that shine down from above. We can also use a combination of effects to achieve the desired look. Depending on your preferences and uses for the space, we could brighten up the entire patio or simply shine a subtle light on small patches for more of a mood lighting effect. Let us know your ideas, and we can offer our professional suggestions. In outdoor spaces like patios, LED lights provide an ideal solution. These lights offer an affordable and energy efficient lighting option that offers strong and lasting light. This type of light works well in outdoor weather conditions, even in areas with a lot of water. LED lights offer a low voltage solution that is stronger and longer lasting than other types of bulbs. This light form provides options of different intensities and color hues to create effects that fit each patio space. Our patio lighting solutions can also illuminate gardens that are an extension of the patio or that are near the patio. We can add lighting to patio garden fixtures like beautiful arbors filled with vines or hanging plants. Plus, we can add lights to gardens around the property so you can admire the beauty of the plants while sitting on your patio table set or bench any time of day or night. With patio garden lights, we can shine light on trees, shrubs, and plants in different ways. We could show the entire garden or only certain features within it. The light fixtures can be prominent or blend into the background. We are also able to play with the intensity and hue of the lighting to best bring out your patio garden features. At Enhanced Outdoor Lighting & Design, we offer expertise both in lighting itself and in the design of the lights. That way, we can offer solutions that fulfill their purposes while enhancing the aesthetic beauty of the property. We can offer a professional design to fit your patio space or are happy to incorporate your suggestions into our planning. Our lighting experts know how to highlight different areas in a subtle way that matches the design. We use our expertise to work with different conditions and situations, depending on whether the patio area receives moonlight, faces a lot of water, includes plants and other factors. We customize our lighting solutions to fit the conditions and uses of the space. Let’s discuss how we could light the patio space at your San Antonio or Austin area home or business. Set up your free consultation by contacting us today.